After confirming the individual load of the fruit the intake delivery window will let you confirm the information regarding the delivery itself. 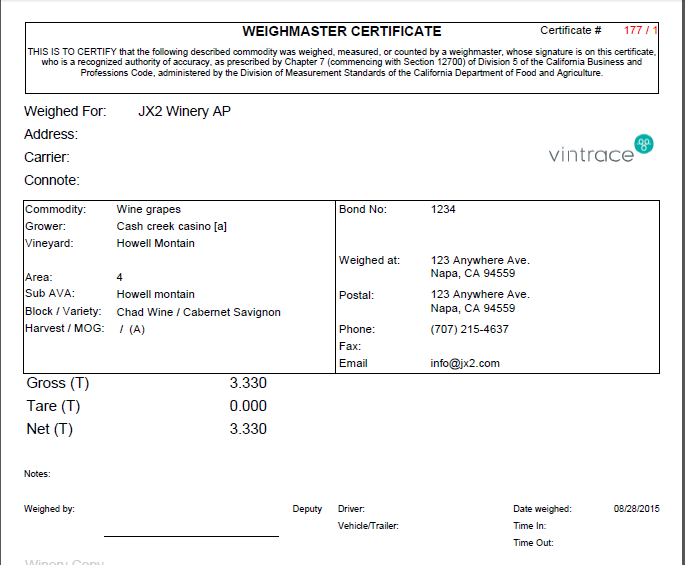 Weighmaster: – Name or Details of the certified weigh authority where applicable (Can have a default set at Winery Setup – Workflow – Defaults). This is most generally used if 3rd-party certified scales are being used. Add Load: - This can be used to record a separate parcel of fruit (different fruit source) is contained on the same truck delivery. Depending on your locale a docket will be printed after the fruit intake data is entered. This contains details about the owner, carrier and grower of the fruit as well as a comprehensive breakdown of the weight. If bins are used in the intake, then the gross/tare of each bin will be printed. 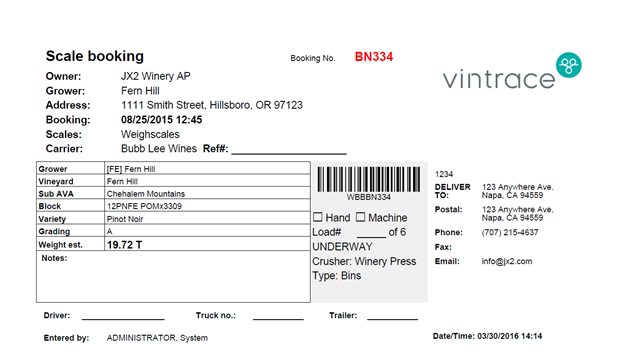 If fruit sample readings were taken on delivery, they will be displayed. The docket sequence is represented as a Unique delivery number / Sequence of the intake. The delivery number will increment for each new delivery of fruit and the load sequence number will only increment – per delivery – if there is more than one load (fruit from a different fruit source) on the truck. For example, a truck arrives with fruit from two different growers. Each load of fruit from a different source should be entered as a separate load on the delivery. The first load will have the docket number of 1/1 and the second will be 1/2. The next truck has fruit from the one grower. The docket number for that load will be 2/1 and so on.